*BLOG FEATURE* Create a pretty charm bracelet with little keys and Swarovski crystal bicones, inspired by The Secret Garden book! Read the Mini-Make blog post HERE. Cut a length of chain 6 inches long or one inch smaller than the size of your wrist. Using a pair of jump rings, attach your lobster clasp to each end of the chain. Take four crystal bicones and create a wrapped loop for each one. You might find this video tutorial on how to do this helpful - CLICK HERE. 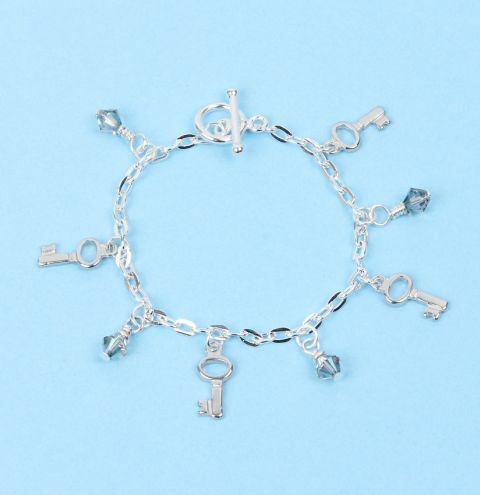 Attach your charms alternating between crystals and keys along your bracelet. I find this looks best, spacing them about 2cm apart or leaving 4 chain links in between.